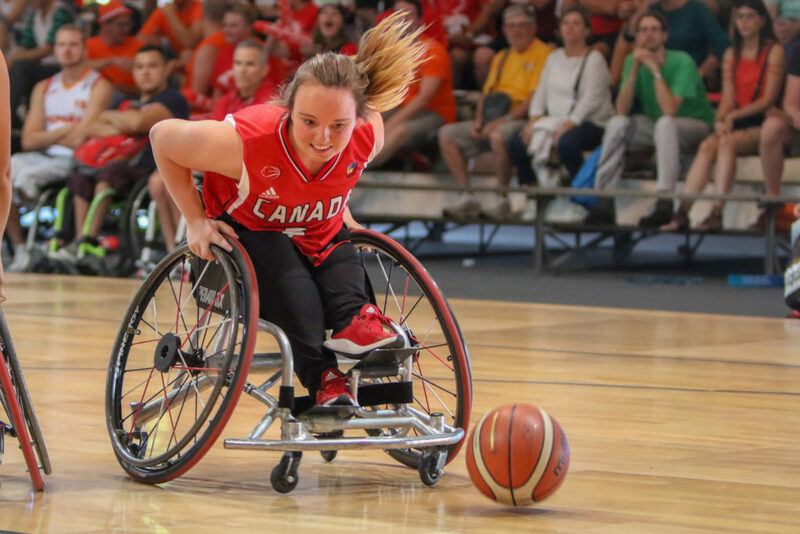 (Hamburg, Germany) The Canadian Women’s Wheelchair Basketball Team rebounded with a decisive 63-34 victory against Spain on Saturday, picking up its first win at the 2018 World Championships in Hamburg. After a shaky start in the opening quarter, Canada flipped the script the rest of the way with a solid game at both ends of the court. The Canadians utilized their depth on the bench and a relentless push on defence to successfully shut down the Spain offense to secure the comeback victory. “We have good players on the bench and who have worked hard all year. I have a lot of confidence in my bench and today they gave us another boost and different energy that worked well,” said Canadian head coach Marc Antoine Ducharme (Chambly, Que.). Canadian Arinn Young (Legal, Alta.) once again paced the floor with a game-high 19 points. Teammate Cindy Ouellet (Quebec, Que.) had 14 points, while Kady Dandeneau (Pender Island, B.C.) dropped 10 points in just over 12 minutes of action. The Canadian women will face Australia at 11:30 a.m. ET on Sunday in their next game, while the Canadian men are also back in action to take on host Germany at 12 p.m. ET. Spain stunned the Canadians in the opening quarter, dropping shots on a 15-point run to take a 17-2 lead with two minutes left before Canada stemmed the tide. Canada then went to work and closed the gap to 11, with Spain leading 19-8 after the first period. The Canadians turned up the heat at both ends of the court in the second frame. Relentless pressure defensively by Canada completely shut down the Spanish offence, as Spain struggled to move the ball up court and to get shots away. Canada also found its gear offensively, with Rosalie Lalonde (Saint-Clet, Que.) and Dandeneau hitting back-to-back long two-pointers to start the quarter. That set the tone for the quarter, as Canada went on an 11-0 run to tie the game at 19, en route to outscoring Spain 21-6 in the frame and taking a 29-25 lead into halftime. “It was about us trying to do the basic stuff right. When I came out I was trying to loop and show my shots. Tamara (Steeves) and I were able to generate some pic and rolls. From there we started to draw our defense more. Another big thing for us was our press. They couldn’t handle it when all five of us played up. We got a couple of eight second calls and that just really helped build that momentum as well,” said Dandeneau. The storyline continued in the second half. Canada continued to roll on the offensive side of the ball, with Young, Ouellet and Lalonde all leading the charge. After building a 13-point lead after three periods, Canada opened the fourth quarter with an eight-point run, including an incredible hook shot three-pointer from Ouellet, to stretch the lead to 21. Canada’s depth proved to be a game changer in this match, as the bench helped settle the score early and then came through to close out the game. All 12 Canadian players saw action on the court, including international debuts for Sandrine Bérubé (Beauharnois, Que.) and Puisand Lai (Toronto, Ont.). Bérubé and teammate Tara Llanes (North Vancouver, B.C.) also scored the first two points at a major tournament of their international careers.